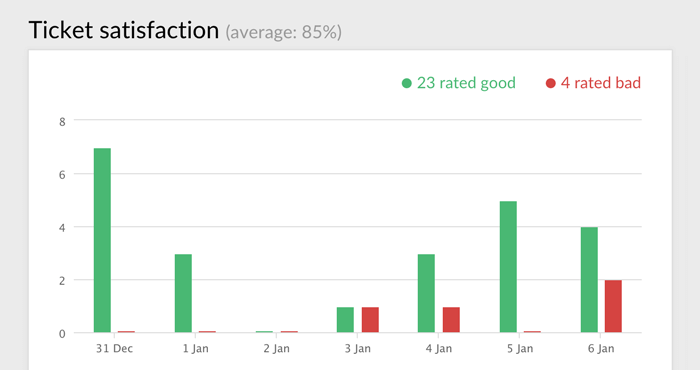 Your customers can rate their experience after their support ticket is solved. Feedback collected this way is invaluable for improving your customer service. Customer receives an email asking to rate the service 24 hours after their ticket was marked as solved. Just as in case of chats, tickets can be rated as good or bad. The 24-hour delay is added in case the customer needs to reopen the ticket. Ticket rating request is enabled by default. To disable it, go to the Ticket settings and un-tick the option. You can view all rates in the Ticket satisfaction report. The report also shows your total satisfaction score. To evaluate particular tickets that were rated as bad, hover your mouse and click on the bar to view them in the tickets section. You can click on the good rates bar likewise. This allows you to quickly see which cases have been resolved poorly or properly.